FILE - People watch a TV screen showing images of U.S. President Donald Trump, left, and North Korean leader Kim Jong Un during a news program at the Seoul Railway Station in Seoul, South Korea, May 25, 2018. North Korea’s foreign ministry said Pyongyang had stopped nuclear and missile tests, dismantled a nuclear test ground and returned the remains of some U.S. soldiers killed in the 1950-53 Korean War. Yet Washington was still insisting on “denuclearization first” and had “responded to our expectation by inciting international sanctions and pressure” it said. “As long as the U.S. denies even the basic decorum for its dialogue partner and clings to the outdated acting script which the previous administrations have all tried and failed, one cannot expect any progress in the implementation of the DPRK-U.S. joint statement including the denuclearization,” the ministry said. The statement on the KCNA state news agency said North Korea, which calls itself the Democratic People’s Republic of Korea, was still willing to implement a broad agreement made at a landmark June 12 summit between U.S. President Donald Trump and North Korean leader Kim Jong Un. FILE - U.S. Secretary of State Mike Pompeo, left, greets North Korea's Foreign Minister Ri Yong Ho as they prepare for a group photo at the 25th ASEAN Regional Forum Retreat in Singapore, Aug. 4, 2018. Kim vowed in Singapore to work toward denuclearization, but the two sides have yet to define a deal to meet that goal and Washington insists sanctions pressure must be maintained during negotiations. 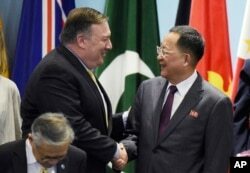 The North Korean statement followed comments this week by top American diplomats stressing the need for Pyongyang to take additional steps toward denuclearization and contentious remarks last week by U.S. Secretary of State Mike Pompeo and North Korean Foreign Minster Ri Yong Ho on the sidelines of a regional summit in Singapore. State Department spokeswoman Heather Nauert said at a regular briefing Thursday that the United States was in touch with North Korea virtually every day or every other day but had no travel plans to announce for the moment. In this photo released by official website of the office of the Iranian Presidency, President Hassan Rouhani addresses the nation in a televised speech in Tehran, Aug. 6, 2018. 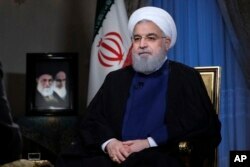 Ri traveled this week to Iran, where President Hassan Rouhani told him the United States cannot be trusted after the Trump administration reneged on a 2015 deal to lift sanctions in return for curbs on Iran’s own nuclear program. U.S. officials have declined to comment on a report on the Vox news website Wednesday saying that North Korea had repeatedly rejected a U.S. proposal for it to cut its nuclear arsenal by 60 to 70 percent within six to eight months. They said it had also not agreed to definitions of the key terms of any agreement, or to any inspection of its nuclear test site, which it claims to have decommissioned, but which U.S. intelligence officials have said may still be operable.